Graffiti plug-in—Over 50 Graffiti Images Scaled Down to Add to your Rolling Stock and Buildings!! Graffiti plug-in contains over FIFTY different scaleable Graffiti Images Scaled to Add to your Rolling Stock and Structures. This is the only graffiti design plugin you'll ever need! The Graffiti plug-in CD works as a plug-in for Model Builder. So you will need to have the Model Builder program to run this CD. You will be able to select it as an option when you purchase Model Builder—you needn't return to this site from the shopping cart to get this plugin product. But if you already have Model Builder, just click our Add to Cart button, above. If you are modeling for any period from 1950 to the present, graffiti was and is an increasingly common sight on buildings, billboards, walls, trucks and rolling stock. Graffiti has found its way out of the subways and onto boxcars, tanker cars, locomotives, water towers, garages, public places, wall murals, restrooms, stop signs, and more. From the old favorite "Killroy was here" to the new "Wild Style" and "Throw Up," tagging is everywhere. We have captured many of great graffiti images and styles, and collected them in glorious color onto this Graffiti CD! Put Graffiti images onto Model Builder walls, in the Model Builder program. Or print out the Graffiti images by themselves onto Decal Paper, cut them out and put your graffiti images onto your rolling stock, existing plastic and scratch-built structures, and anything you can think of—like the spray-can artists do! 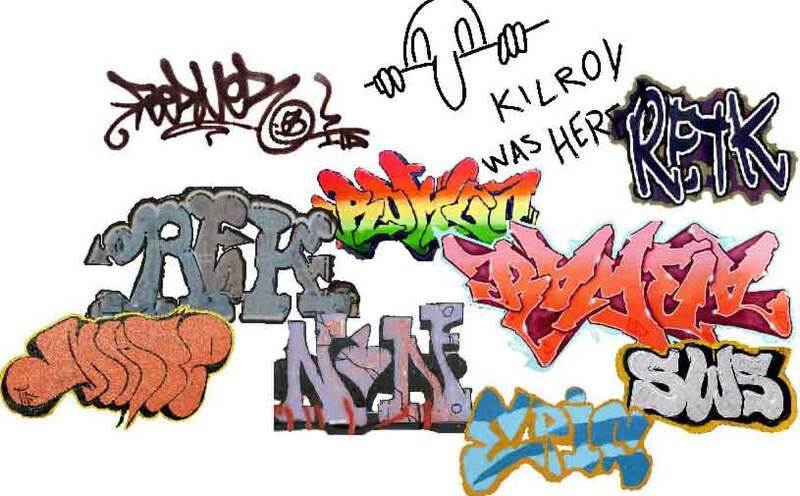 There are lots of types, from the old "Killroy was here" design to the new "Wild Style" and "Throw Up" styles. Better Together! Graffiti plug-in requires Model Builder. The designs in Graffiti plug-in will import into Model Builder as another palette to work with. Let your imagination run wild at all the decorating possibilities! Graffiti plug-in runs on Windows 2000, ME, XP, Win7, Win8, Vista. We print all of our graffiti-filled wall designs using an ordinary $99 Inkjet Printer and Matte Photo Paper for best image quality. You can also use plain paper or decals. 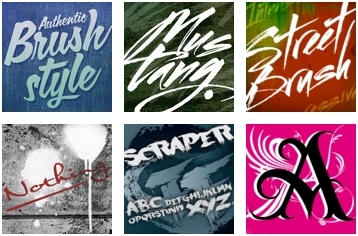 Want to get some cool Graffiti fonts like this? You came to the right place!